Use Pooh scrapbook paper and other accessories to create playful pages for infant and child memory albums. This lovable Disney character and his friends never go out of style. Winnie the Pooh has served as the inspiration for several scrapbook paper lines over the years. Winnie the Pooh and Baby Too! 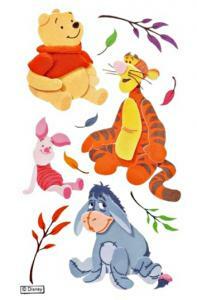 : This set of 11 patterned sheets features colorful Pooh graphics for baby scrapbook pages. Licensed Pooh Phrases Scrapbook Paper: You'll find a colorful Pooh design with phrases such as "Bee Yourself" and "Silly Old Bear" in this collection. Sandylion Disney Boy Mega Paper Pack: This 150 sheet paper pack includes Winnie the Pooh as well as papers with several other Disney characters. There are 3 sheets of each featured design. 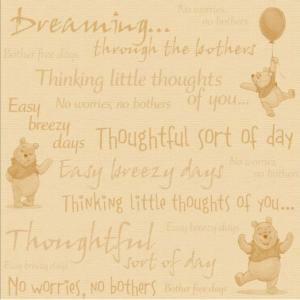 Sandylion Little Thoughts Pooh Paper: Have fun creating Winnie the Pooh pages with these papers that offer several phrases, including "No Worries, No Bothers" and "Easy Breezy Days." The slightly vintage color scheme lends a more sophisticated look to your scrapbook pages. Double-Sided Sundance Pooh Paper: This double-sided paper shows Winnie the Pooh on the front and a colorful dot pattern on the back side. It is perfect for use in making punch art embellishments for your scrapbook. If you're a digital scrapbooker, Etsy has several sellers offering products for Winnie the Pooh fans. 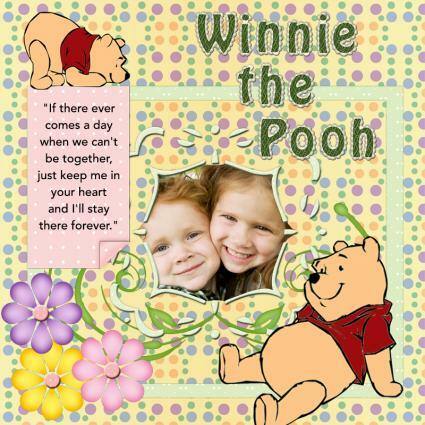 Digi Craft Studio: This Winnie the Pooh quick page is the perfect choice for the scrapbooker in a hurry. There's room for one special photo plus journaling. Mon BonBon: This set of 10 Winnie the Pooh inspired digital scrapbook papers features everyone's favorite bear, as well as bee, honeypot, and honeycomb designs. MC Digital Designs: Try a more graphic take on Disney's classic characters with this collection of modern designs inspired by the markings on Winnie the Pooh, Tigger, Eeyore, Piglet, Rabbit, Owl, Huffalump, and Roo. I Love Disney offers free downloadable fonts for many of your favorite Disney characters, including Winnie the Pooh. Font Space has a free downloadable Pooh dingbat font with installation directions. Stickers offer an easy way to quickly embellish your pages. Visit the following vendors to find many Winnie and friends stickers to add to your layouts. Four Sheet Sticker Pack: This affordably priced package of Pooh stickers is perfect for all your scrapbooking projects, with enough stickers left over to encourage your children to make their own scrapbook pages. Dimensional Pooh Stickers: These stickers from Jolee's Boutique have a 3D paper pieced appearance, so they'll quickly add a handmade look to your scrapbook pages. The right album makes all the difference in displaying your scrapbook pages. You might choose to take a subtle approach with a plain album cover, or opt for the full treatment with one of the Winnie albums listed below. EK Success Frame a Name: This classic Pooh scrapbook album would be perfect for recording baby milestones. Tiggerriffic Times: The bright colors in this album design make it a great choice for pictures of an energetic toddler. "If there ever comes a day when we can't be together, just keep me in your heart and I'll stay there forever." "Promise me you'll never forget me, because if I thought you would I'd never leave." "You can't stay in your corner of the forest waiting for others to come to you..."
When making a Winnie the Pooh scrapbook, remember to use only archival-safe materials designed to stand the test of time, and to include pertinent journaling details like dates and the names of the people in your photos. You want your finished scrapbook to be something that future generations of your family will be able to enjoy.